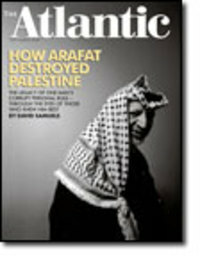 David Samuels has a lengthy article in the September 2005 issue of The Atlantic Monthly -- “In a Ruined Country -- How Yasir Arafat destroyed Palestine” -- that is stunning in its detailed examination of the utter corruption of Arafat and those who surrounded him (hat tip: Ed Lasky). The amounts of money stolen from the Palestinian Authority and the Palestinian people through the corrupt practices of Arafat's inner circle are so staggeringly large that they may exceed one half of the total of $7 billion in foreign aid contributed to the Palestinian Authority. The biggest thief was Arafat himself. The International Monetary Fund has conservatively estimated that from 1995 to 2000 Arafat diverted $900 million from Palestinian Authority coffers, an amount that did not include the money that he and his family siphoned off through such secondary means as no-bid contracts, kickbacks, and rake-offs. A secret report prepared by an official Palestinian Authority committee headed by Arafat's cousin concluded that in 1996 alone, $326 million, or 43 percent of the state budget, had been embezzled, and that another $94 million, or 12.5 percent of the budget, went to the president's office, where it was spent at Arafat's personal discretion. An additional 35 percent of the budget went to pay for the security services, leaving a total of $73 million, or 9.5 percent of the budget, to be spent on the needs of the population of the West Bank and Gaza. The economy of the Palestinian territories, which had enjoyed startlingly high growth rates after 1967, when it passed from Jordanian and Egyptian control into the hands of the Israelis, stagnated and then went backward. What followed Arafat's return to Palestine was a decade-long thieves' banquet at which Fatah's old guard divided up the spoils of Oslo and treated ordinary Palestinians as conquered subjects. Oslo turns out to have been a disaster not only for the Israelis, but for the Palestinians as well. Dr. Levin's original and powerfully persuasive analysis relates Israeli diplomacy of the nineteen-nineties to psychological responses common among chronically besieged populations, whether minorities subjected to defamation, discrimination and assault or small nations under chronic attack by their neighbors. More particularly, he demonstrates links between the evolution of Oslo and the long history of Diaspora Jews being subjected to persistent abuse. This case study in the psychology of a community under chronic attack takes on broader significance at a time when even traditionally safe and secure societies such as the United States are confronting the psychological challenges posed by terrorist assaults. JCI: You chronicle the continual effects of discrimination on the Jewish psyche, over hundreds of years, in which Jews have internalized anti-Semitic criticisms of themselves. Is there not only a continual but a cumulative effect of this as well? In other words, is there a tipping point at which the Jewish psychological makeup is permanently changed? Or is the state of mind you describe reversible at any time, including now? Dr. Levin: I believe the phenomenon of -- to paraphrase the early Zionist Max Nordau -- Jews seeing themselves through anti-Semitic eyes can always be reversed; but to free Jews from the bonds of their learned self-revulsion requires leaders giving them a different message. No one exemplifies the power of such leadership as much as Herzl, who reminded Jews that they were part of a great nation rich in its spiritual, ethical and intellectual traditions and contributions to the world and that they have as much a right as any other nation to an independent and secure national life. JCI: You write that people convinced of the essential rightness of an endeavor will regard flaws in its execution "simply as problems that must be addressed in more properly advancing the effort," while those without that belief will more likely interpret such flaws "as confirming their comprehension of the entire undertaking as misconceived." After decades of post-Zionism followed by the massive resurgence of anti-Semitism, where do you think Israel and Jews generally are on this divide? Dr. Levin: I definitely believe that most Israelis, and most Diaspora Jews as well, fall into the former group. Certainly the constant bombardment by biased world media, governments, and cultural and academic elites purveying bigoted, kangaroo-court indictments of Israel -- even calls for its dissolution -- does have a corrosive impact on many individuals. It most affects those least educated in the realities of Israel, least connected to a Jewish identity, and most eager to ingratiate themselves with the anti-Israel, and often anti-Jewish, bigots. But I believe that these remain a distinct minority. Stemming the growth of that minority requires challenging the bigots, and those Jews who align themselves with them, and also educating Jews about the realities that the bigots ignore or misrepresent and distort in their attacks on Israel. JCI: Your conclusion is that if and when peace comes, it will be "determined primarily by decisions and actions of the Arabs and not by Israel" and that those decisions and actions will be shaped by "political and social dynamics whose evolution is, and will remain, essentially impervious to Israeli influence." What role, if any, in this do you see the pro-democracy campaigns championed by George W. Bush and Natan Sharansky? What other dynamics will be required? Dr. Levin: I am sympathetic to the view that democratization of the Arab world is a necessary precondition to peace. The West’s half-century of coddling Arab strongman regimes out of a concept of Realpolitik has proven disastrous not only in the context of the Arab-Israeli conflict but with regard to Western-Arab relations and also with regard to the situation of virtually all the minorities -- both religious and ethnic -- living amid the Moslem Arab majority in the Middle East. But I am not convinced that the general population of the Arab states is eager for democratization -- a necessary precondition for its taking hold. On the contrary, I believe that many people in the Arab world remain intoxicated with the messages constantly given them by leaders both secular and religious; a message not unlike that proffered to Germans between the world wars: That they are heirs to a superior nation which has been robbed of its proper superior status and must militantly reclaim it from those who have stolen the Arabs’ rightful place in the world. It is the message disseminated by what one liberal Arab writer called the "twin fascisms of Islamism and pan-Arabism." For democracy to take root will require an end to the Arab romance with this fascist world view. JCI: In the current issue of Azure, Natan Sharansky writes of the competing visions of David Ben-Gurion and Theodor Herzl. According to Sharansky, Ben-Gurion and his generation of Zionist leaders rejected Judaism and European traditions as a binding force, and sought to replace them with a "sabra" ethos that would integrate Diaspora Jewry into "one homogeneous Hebrew brigade" that would make "no division between man and Jew." Sharansky reacts negatively to attempts to create a "new man" (having grown up in "a vast laboratory of such an attempt"). Sharansky prefers Herzl’s vision of diverse communities from around the world replanted in Israel, allowing religious Jews, Sephardi Jews, Russian Jews and others the freedom to continue their own traditions in their new state. He believes it was important to create a common language and culture at the beginning in order to create a state, but that Israel’s future now depends on allowing all these diverse traditions to flourish. Based on your knowledge as a historian and psychiatrist, do you have a view about this issue? Dr. Levin: Certainly, as Sharansky concedes, it was necessary to create a common language and culture in Israel; and I would argue that doing so was not only a necessity in the days of the Yishuv and for the early years of the state but rather a common language and culture is an ongoing necessity. But the socialist Zionist hostility to introduction of Diaspora religious and cultural traditions went beyond the demands of forging a unifying culture, just as the socialist Zionist concept of a "new Jew" went beyond simply creating a new national identity of "Israeli." Rather, that hostility, and the socialist Zionist concept of "new Jew," were comprehended as much in negative terms -- eradicating the "old Jew" -- as in the positive of creating "Israelis." It is that negative agenda that accounted for the overheated hostility exhibited by Ben-Gurion and others to bringing Diaspora ways to Israel. (Ben-Gurion was far from the worst in this regard and recognized and valued -- and educated himself in the literature of -- Jewish faith and Jewish history much more than did most of his colleagues.) And this negativity was shaped in large part by socialist Zionist absorption of European anti-Semitic indictments. A common perspective among Russian socialist Zionists was that the real targets of European Jew-hatred were the Jewish religion and the ways of the Jewish bourgeoisie and of European Jewish intellectuals and cultural elites. In the context of this perspective, the Russian socialist Zionists chose to likewise target these aspects of Jewish life and define the Zionist task as creating a new Jew free of the religious and economic and cultural dross of the "old" Jew. They chose to believe that doing so was the path to placating the haters and making Jews a "normal" nation. Clearly, Sharansky is right in wanting to see Israel move beyond what remains of this bias and be more receptive to the rich religious and cultural traditions those making aliyah bring with them from the Diaspora. JCI: You attribute some of the perverse psychological effects you describe on a failure of Jewish communal institutions, and you believe the strength of these institutions, together with that of Israel, will be the critical determinant of the future of Jewish continuity. Which Jewish institutions are most in need of improvement, and what are the specific improvements that you think are most critical? Dr. Levin: In generic terms, any Jewish institution that distances itself from Israel and its policies or supports Israel only in general terms without challenging the bigoted attacks on the Jewish state -- whether those attacks are by churches, media, academics or others -- is part of the problem. I believe it is the obligation of Jewish institutions to familiarize themselves with the realities of Israel’s struggle and of the challenges it faces and to speak out forcefully against those who would threaten the state by misrepresenting those realities and pushing the agenda of Israel’s enemies. Indeed, I believe that Jewish institutions should take forceful stances wherever populations are threatened by their neighbors with mass murder and extermination. Surely their obligation is no less when it is the population and state of Israel that is threatened. JCI: Sharansky’s book ("The Case for Democracy") has not yet been published in Hebrew, so its impact on the Israeli public has presumably been limited to date. Are there plans to publish your book in Hebrew? What has been the general reaction to your book so far? Dr. Levin: There are no plans as yet for a Hebrew translation. I hope there will be one. The reaction to my book thus far has been very positive and very gratifying. © 2005 Jewish Current Issues. 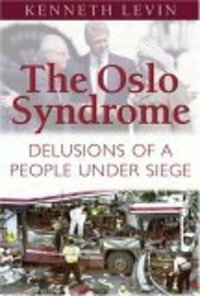 Reviews of “The Oslo Syndrome” are here (Edward Alexander in Front Page Magazine), here (David Hornik in the Jerusalem Post), here (Frank Gaffney in the Washington Times), here (blurbs in Barnes & Noble), here (customer reviews), and here (JCI). Rice said that she is very worried that Palestinian Authority Chairman Mahmoud Abbas will be weakened and collapse, and that Hamas will take over the Gaza Strip after the Israeli disengagement. "[W]hen we asked them why is Israel doing it . . . the unequivocal answer of the Palestinian public is because Israel is forced to. Sharon has been forced by violence to pull out from Gaza. Three-quarters of the public believe this is a victory for armed struggle against occupation," said Shikaki. Right now [Shikaki said], the people believe that violence has forced Sharon's withdrawal plan, so Hamas is claiming the victory. Since Abbas has spoken out against the militarization of the intifadah, he cannot claim the victory since the people are linking it to violence. But Hamas can. Understandably, Barak sought to make withdrawal [from the security zone in southern Lebanon] look like Israel’s decision, made out of strength and conviction. But Hizbollah had other ideas. As Israel began to dismantle some of its outposts and turn over others to its proxy army, the Southern Lebanese Army (SLA), Hizbollah went on the offensive. . . .
As a logistical feat, [the withdrawal from Lebanon] was another source of pride for the Israeli military. But in the region, particularly given the collapse of the SLA, the withdrawal looked like a defeat. Suddenly, there was a new model for dealing with Israel: the Hizbollah model. Don’t make concessions. Don’t negotiate. Use violence. And the Israelis will grow weary and withdraw. It mattered little that Barak had announced his intentions a year in advance, or that Israel had no claims, no historical attachment, and most importantly, no Israeli settler presence in southern Lebanon, as it did in the West Bank and Gaza. In a textbook case of unintended consequences, the Israeli withdrawal from Lebanon fostered an environment supporting increased radicalism, not moderation. Hizbollah was celebrated for forcing the Israelis out. Hizbollah now has 12,000 rockets capable of hitting northern Israel. How many will Hamastan have? Do you think the “successful” Israeli withdrawal from Gaza will lead to: (1) a third intifada on the West Bank, as the Hizbollah/Hamas model moves to the next stage of surrounding Israel; or (2) “a sense of confidence and trust between the Israelis and Palestinians as they look to a better future”? Time is running out for the Palestinian leadership to confront the terrorists. . . . Lest the Palestinians miss another historic opportunity, the world should insist that they crack down on terrorism now. In any event, the only penalty for missing an “historic opportunity” is always . . . another “historic opportunity.” The Palestinians have now missed seven in a row: they could have had a state in 1937 (the Peel Commission proposal), 1947 (the UN Partition Plan), 1967 (the Allon Plan), 1978 (the Egypt-Israel peace treaty), 2000 (Camp David), 2001 (the Clinton Parameters/Taba), and 2003 (the Roadmap). It may be that a state next to Israel is not the historic opportunity they seek. On the contrary, as they watch as Israel unilaterally turns over land on its southern border to Hamas, replicating the unilateral turnover of land on its northern border to Hezbollah, they may feel instead that they are moving steadily closer to a different historic opportunity. In a joint Israeli-Palestinian public opinion poll conducted last month, 72% of the Palestinians saw Sharon’s disengagement as “a victory for the Palestinian armed struggle against Israel.” Why would they conceivably want to “crack down” on what produced it? His attack will be encouraged by the official Palestinian media and by PA-appointed and paid clerics in their sermons. He will not be stopped by PA forces. If he succeeds in killing Israelis he will be praised by PA institutions, the ruling Fatah group, and the Palestinian media. If he is captured or arrested by Israel, the PA will demand his release. After an attack he will not be arrested by the PA. In a few high-profile cases attracting Western pressure he will be placed under house arrest and soon allowed to "escape." If he is killed the PA will make him an honored martyr. If he is a member of the ruling Fatah group, it will not criticize, expel or punish him. Whatever he does, including the brutal murder of Israeli civilians, he will still be welcome to join the PA payroll as a security man. If as a member of the security services he commits a terror attack, he will not be fired. Remarkably, nearly half (47 percent) of the attacks since the cease-fire have been claimed by Fatah, the ruling group in the PA, into whose hands the international community now proposes to place $3 billion in aid [actually $9 billion -- ed.]. To date, no Fatah official, member or security force employee has been punished, expelled, or fired for involvement in almost 400 attacks. Meanwhile, yesterday’s roundup of cease fire news is here. [Abba] Eban’s characterization of Israel s "Auschwitz borders" [in a November 5, 1969 interview] is now 36 years old, and relatively few people remember the Six Day War. Nowadays one is just as likely to hear it referred to as the "1967 Middle East War," apparently from politically-correct deference to Arab feelings, for after only six days of fighting, vastly out numbered Israeli forces were in position to march on Cairo, Damascus and Amman. Before the war started, however, such a victory was anything but certain. Israel in 1967 was isolated, not even twenty years a state, and subject to dire provocation, threats and hostile actions by surrounding Arab countries. . . . Even for those who lived through it, it is hard to recall the atmosphere that preceded the war, which Lieberman’s day-by-day recounting recaptures. Worth reading in its entirety. We were born into a Jewish identity that the Soviet steamroller had almost completely crushed. We knew nothing of our roots, only that for some reason others considered us different and inferior. We knew all too well the anti-Semitic stereotypes about greed, parasitism, and cowardice -- but about what Judaism stood for, we knew nothing. That was before 1967. In the months leading up to the war, animosity towards us reached a fever pitch. Then, in six dramatic days, everything changed for us. The call that went up from Jerusalem, “The Temple Mount is in our hands,” penetrated the Iron Curtain and forged an almost mystic link with our people. And while we had no idea what the Temple Mount was, we did know that the fact that it was in our hands had won us respect. Like a cry from our distant past, it told us that we were no longer displaced and isolated. We belonged to something, even if we did not yet know what, or why. Sharansky’s essay, an extended reflection on whether the vision of David Ben-Gurion or Theodor Herzl represents the greatest hope for Israel’s future, is also worth reading in its entirety. [A]ny final-status agreements concerning the West Bank, Gaza, Sinai Peninsula, and Golan Heights would necessarily have to involve the annexation of at least some territory as a correction to the extremely unstable 1949 armistice lines, whose very vulnerability had invited Arab aggression and led to the perpetuation of conflict. Immediately after the Six Day War in 1967, [Yigal] Allon proposed a series of territorial adjustments that would incorporate into Israel key tracts of largely unpopulated land, especially in the Jordan Valley, while maintaining territorial contiguity between the Palestinian population centers and the Kingdom of Jordan . . . .
[I] believe that it is fundamentally in the interests of the United States that we not bear responsibility for the defense of Israel. And therefore, Israel has to be able to defend itself and that means borders that can be defended. If you look at the size of the Israeli Army that would be required on those  borders with no time to mobilize, it is an army of a size that Israel cannot sustain over the long term. It takes, as I think the report observes, 48 hours to mobilize the Army fully. Where do you find those 48 hours? Geography is important, and the concept of defensible borders has been at the very heart of a potential solution between Israel and the Palestinians from the beginning, from the earliest U.N. resolutions. It's a shame that we lost sight of it for so long in a period in which the focus was shifted to other issues. It is a useful reminder that U.N. Resolution 242, although colloquially referred to as "land for peace," is actually more accurately described as "land for secure and recognized boundaries" -- which will themselves produce the peace that a mere "agreement" cannot. Forgive my insistence on truth in labeling. But the habit of naming these lines "1967 borders" is meant to deceive, as if it was Israel that broke the ceasefire and not Egypt, Syria, and Jordan, and as if all the troubles started with the occupation. This little correction reminds that the Palestinians, even the more sober among them, had not and have not yet come to terms with the very existence of Israel. After all, the PLO was founded long before Israel held any part of the West Bank or Gaza and while Jerusalem was divided, with the Western Wall and other Jewish holy sites in Arab hands. . . . It is actually quite frustrating to need to dwell on this elementary history. But it is also a necessity. Almost nobody knows it. Which is why Anne Lieberman's recounting, Natan Sharansky's recollection, and Dan Diker's analysis are timely and important. The title of this 599-page book does not begin to capture its scope and import. This is one of the most important books published in many years. Kenneth Levin approaches this subject with extraordinary credentials: a medical degree from the University of Pennsylvania, currently clinical instructor in psychiatry at Harvard Medical School, with a private practice in psychiatry. But equally importantly, he also brings the knowledge and skills of a historian. He holds a Ph.D. in history from Princeton University, and has written extensively on Israel and the Arab-Israeli conflict. And it is the combination of his medical experience and his expertise as a historian that makes this book one of the most extraordinary volumes in recent history. Between the Introduction and final chapters is a history of the Jewish people under siege -- from ancient and medieval times, through the European ghettoization to de jure emancipation, to Zionism and the creation of Israel, and through the decades of post-Zionism leading up to and through Oslo (and unfortunately beyond). It is an unrelenting accumulation of historical fact and psychological analysis that is simply overwhelming. You cannot read this book and remain unchanged. She is not a writer known for exaggeration. You can read an excerpt here, or read Levin’s recent front-page essay in The Jewish Press. They are both powerful, but they barely convey the cumulative effect of the book, which is absolutely essential reading. The primary target of the terrorists, the government argued, was the peace process itself; it was not Jews or Israelis per se they sought to kill, but the “peace.” So the proper Israeli response would be to accelerate the process and the pace of concessions and thereby frustrate the terrorists. . . .
And this is what they got, and keep getting. PA cabinet secretary Samir Hilaileh said the PA was pursuing its efforts to resolve the problem of hundreds of gunmen who are wanted by Israel in the West Bank. He said that after the gunmen would be incorporated into the PA security forces, they would be trained as policemen. One man’s gunman is another man’s policeman, or something like that. Meanwhile, the Palestinian Authority has rescinded its decision yesterday to “crack down” on Islamic Jihad and decided to crack down instead on . . . idiots. Palestinian officials in Ramallah made it clear that "only those directly linked to the [Netanya] attack would be punished" less than 24 hours after a senior Palestinian Authority security official announced that the PA was planning to crack down on Islamic Jihad for its role in Tuesday's suicide bombing in Netanya. PA chairman Mahmoud Abbas, who described those responsible for the Netanya attack as "idiots," is expected to hold talks in the Gaza Strip on Thursday with leaders of Hamas and Islamic Jihad on ways of preserving the unofficial truce with Israel. You can understand Abbas’ frustration. How smart do you have to be to keep quiet for a month or two, while Israel hands over land to Hamastan, rids it of all Jews, and helps out with the demolition? And, if you’re Israel, how smart do you have to be not to do that? 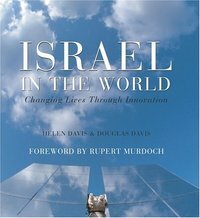 Helen Davis and Douglas Davis’s book, beautifully constructed and written, provides a remarkable compilation of the people, products and processes that Israel has contributed to the technologies and systems of the twenty-first century world, working in the smallest of countries in the harshest of conditions. The groundwork for all Israel’s extraordinary innovation was laid by Israel’s founders, who understood that Israel had virtually no raw materials and recognized at an early stage in the life of the new state the urgent need to develop Israel’s natural “brain” resources. Today, more than one hundred thousand students are enrolled in Israel’s universities, with about 21 percent of all undergraduate students and 50 percent of all doctoral candidates specializing in the sciences or medicines. . . . Proportionately, Israel has more university graduates -- and particularly more engineers -- than any other country on earth (135 per thousand engineers, compared to 85 per thousand in the United States). . . The consequence is that Israel has the largest concentration of high-tech companies outside Silicon Valley. Chances are that your computer has been thoroughly checked by Israel’s Orbotech software systems and that it is run on Pentium MMX or Centrino technology designed at Intel’s laboratories in Israel. Most of the technology for the Microsoft Windows NT operating system was developed at Microsoft’s R&D facility in Israel, while IBM’s Haifa research Laboratory has developed cutting-edge storage and retrieval systems and verification technologies. And all this is protected by firewall technology developed by Israel’s Check Point Software. . . .
And if you have just accessed your voicemail, sent text messages or transmitted pictures through your mobile phone, you were using technologies developed -- again in Israel -- by Comverse. The chapters on medical technology, anti-terrorism databases (used by the FBI), desert agriculture, early education systems, protection of endangered species, and other areas are astounding. Amazing accomplishments.